ATLANTA -- In our previous articles on the EMV payment liability shift, we recommended convenience-store retailers view the necessary EMV transition as part of a full-site marketing and technology plan. The shift will compel many fuel retailers to adopt improved credit-card security standard sooner rather than later, a potentially costly upgrade that we encourage retailers to take full advantage of. The importance of making tour decision on the matter—even if it’s to do nothing, rather than not being informed and assuming EMV liability by default—cannot be overstated. The need to upgrade both point-of-sale (POS) systems and gas pumps to accept EMV cards will accelerate the capital spending cycles of retailers and jobbers, stretching many budgets. This, and other desired marketing perquisites—loyalty programs and on-pump advertising, for example—mean dealers will have significant capital needs that will stretch beyond their traditional annual capital budgets. In developing a capital strategy, whether for a single-site c-store owner, a multisite operator or a jobber network, the benefits of each financing option creates trade-offs that lead to a unique mix for each business’s strategic objectives. Cash, if available, is the easiest way to finance equipment. The trade off in using cash for equipment purchases is that the cash will then not be available to support strategic growth initiatives, such as purchasing additional sites or land. Using cash for equipment purchases limits the financial leverage that can be obtained on growth investments. Line of credit or other loans are a second way to finance gas dispenser, POS or other upgrades for convenience stores. The benefits of bank borrowing include generally lower interest rates; but the offset to these rates often is a requirement that land, buildings or other assets are used as collateral for the loan. As with cash, using a line of credit for a depreciating equipment asset limits a firm’s borrowing power for strategic growth investments. Equipment financing has the benefit of requiring that only the equipment being purchased is used as collateral. This aligns the collateral more closely with the financing amount, and leaves lines of credit and cash available for more strategic options. Equipment financing can be used for both new equipment, such as gas pumps, POS or price signs; site upgrades, including LED lighting and underground storage tanks; and equipment retrofits, such as EMV upgrades to fuel dispensers and POS. From time to time, equipment manufacturers such as Veeder-Root, Gilbarco and other c-store equipment providers offer special financing incentive programs that provide low interest rates for up to 5 years. Operating leases are off-balance-sheet financing vehicles that have many of the same benefits of equipment financing, with the added benefit of being permitted by other lenders as an exception to debt-to-equity covenants on existing loans. 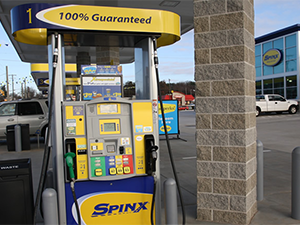 For many C-store owners who have limited borrowing ability, have maxed out their bank lines of credit, or have tapped out their family members’ lending interests, the ability to work with their fuel jobber is a great way to expand a partnership. Jobbers—who may have stronger borrowing capabilities than dealers—can use their financial strength to help their dealers upgrade their sites, achieve EMV compliance with their brands and improve the image of the site. Difference in tax rates. Many retailers are often in the 10% to 15% federal tax bracket, while fuel marketers generally are taxed rates approaching 39.5%. On a $10,000 POS system, this results in a difference in depreciation benefit of up to $2,950. Difference in borrowing costs. Often fuel marketers have a more-established credit history than c-store dealers, better documentation and a history of larger transactions, resulting in their ability to borrow or finance equipment at lower interest rates than dealers. This difference, over a five-year lease, can generate significant interest savings on a dispenser or POS upgrade. As an example, a 5% difference in borrowing costs for financing six gas pumps could create a savings of $4,500 in annual interest costs. Section 179 benefits: The anticipated renewal of Section 179 tax benefits for 2015 would allow for accelerated depreciation, creating an almost immediate cash flow impact. This accelerated deduction covers 100% of any capital improvement up to $500,000, and 50% of the next $1.5 million. Combining these benefits creates an opportunity for fuel jobbers and c-store retailers to work together to provide programs that benefit both parties. One option to achieve these leasing benefits is for the jobber to supply the equipment to the dealer for use on his site. This ensures that the dealer is in compliance with network specifications for EMV and other brand standards, while allowing the dealer to improve and upgrade their site image.